John Hartford once said that Mike Compton knows more about Bill Monroe style mandolin than the Father of Bluegrass himself. Mike was born in 1956 in Jimmie Rodger’s hometown of Meridian Mississippi. His great grandfather was a fiddler. 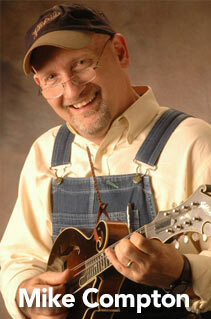 Mike was exposed to old-time music at an early age and received his first mandolin at the age of 15. He moved to Nashville in 1977 and worked for the next three and a half years with North Carolina legendary banjoist, Hubert Davis and the Season Travelers. He recorded on three of the group’s records. In 1985 he was recruited by Pat Enright for the Nashville Bluegrass Band, and during Compton’s initial stint in the group, 1985-1988, he appeared on the four albums that first brought the band to prominence. After a year working in the Catskill Mountains, Mike returned to Nashville and began working for John Hartford, which he did up until John’s death in 2001. He was involved in Hartford’s last half dozen recordings. In 1991 Mike began working with the incomparable David Grier, touring the US and Japan. The two recorded a duet album shortly thereafter which was nominated for Album of the Year by the IBMA in 1992. In the fall of 2000, after a tour of the southwestern US with Grier, Mike was offered his mandolin slot with Nashville Bluegrass Band and he didn’t hesitate to rejoin. The Group has won two Grammy Awards, two Entertainer of the year honors from the International Bluegrass Music Association and four wins as IBMA’s Vocal Group of the Year. They have become the acoustic music group to watch in the new millennium. The NBB was the first bluegrass group to perform in the People’s Republic of China and has also staged concerts in Egypt, Brazil, Crete, Bangladesh, Bahrain, Qatar, the Azores, Iraq and Israel, not to mention Denmark, Germany, France, Ireland, Switzerland, Turkey, Japan , Italy, Spain, and England. The group has performed with Lyle Lovett and Mary Chapin Carpenter and performed to a sold out crowd at Carnegie Hall, and backed artists as diverse as Bernadette Peters and Clint Black. Spring of 2001 led the NBB into a concert series with the Nashville chamber Orchestra which led Mike on a new pursuit of music reading skills and basic music theory and writing. Mike recently received Grammy Award acknowledgement for playing the mandolin on two award winning projects, “Oh Brother Where Art Thou?”,Album of the Year and Best Compilation Soundtrack Album, and “Down From the Mountain”, Best Traditional Folk Album, which included artists such as Dr. Ralph Stanley, Norman and Nancy Blake, Alison Kraus and Union Station, Gillian Welch/David Rawlings, Emmy Lou Harris, The Whites, The Cox Family, The Fairfield Four, Chris Thomas King, NBB, John Hartford, to name a few. He was also part of last year’s sold out “Down From the Mountain” tours which included the original soundtrack cast and Ricky Skaggs, Patty Loveless, the Del McCoury Band, and Rodney Crowell. The Mississippi State Senate honored Mike in March of 2002 with State Resolution No. 45 commending his accomplishments. The Resolution was awarded on the Senate floor and shortly thereafter followed by renditions of Bill Monroe’s “Old Ebeneezer Scrooge” and “I’ll Fly Away”, which prompted the senators to sing along. Mike was featured prominently on Dr. Ralph Stanley’s recent work produced by recording industry legend TBone Burnette. Mike recently participated in the soundtrack for the upcoming movie” Cold Mountain” also produced by Mr. Burnette. Mike does numerous workshops and music camps throughout the year. He is currently working on material for the tenor guitar, studying country blues mandolin styles and taking fiddle lessons. He is a prolific composer and treasures his memories of a friendship with his mentor, Bill Monroe.